How to set transparency per polygon in a shapefile in QGIS? a polygon with field "value" = 1 should be fully transparent whereas field with field "value" = 0.4 should have a 40% transparency value. The color of the polygons should depend on another field. Preferable I would do this using one layer but using two layers with some blending modes is OK as well. You can use data defined properties for this. Use the style tab on the layer properties and click the expression button to the right of the color. In there you can use the function color_rgba( red, green, blue, alpha ) to create the color. All values need to be between 0 and 255. This will give you a totally red style with the alpha defined from a field "transparency" as per your specification in the question. In the expression editor you will find a number of other color related functions that may better suit your needs, just explore them and read their documentation directly in the expression editor. For QGIS >= 2.12 also consider @ndawsons answer. What this expression does is takes the original polygon color (@value) , and replaces the alpha channel (opacity) with the value calculated from the field). This means you can set the fill color expression and then happily go ahead and use categorised or graduated renderers to automatically set the base fill color and the opacity rule will still be respected. No need for hard coding the rgb values this way! You can also set this values in the Layer Properties of the layer (right click -> Properties). Use Style -> Categorized then select the column you want to use, for example 'value', choose the colors in the color ramp and click 'Clasify'. 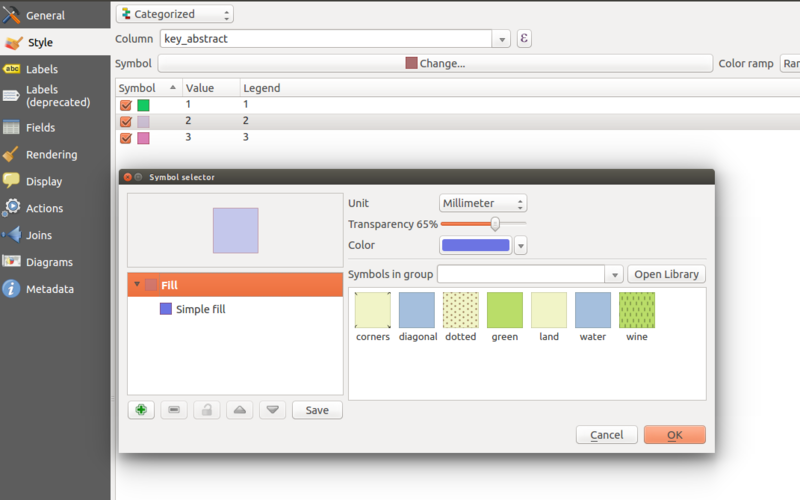 Then you can define the color of each value and its transparency. If you add new values to the used layer click on Clasify to add them to your existing style. Not the answer you're looking for? Browse other questions tagged qgis style color expression or ask your own question. Is there a way to hillshade vector polygons with a DEM in QGIS? in a single vector layer I have a three of polygons with different field values (e.g1,2,3). How Can I color each field value polygon differently? Is <PerpendicularOffset> only available in GeoServer from version 2.9? Can I use a polygon to show a WMS-layer inside while maintaining transparency outside? How Does QGIS Read 'nodata' in 3 Band Raster Data? Join attributes from polygon layer using spatial relationship - Joining polygon layer has overlaps in QGIS? Transparent color settings in ArcMap?